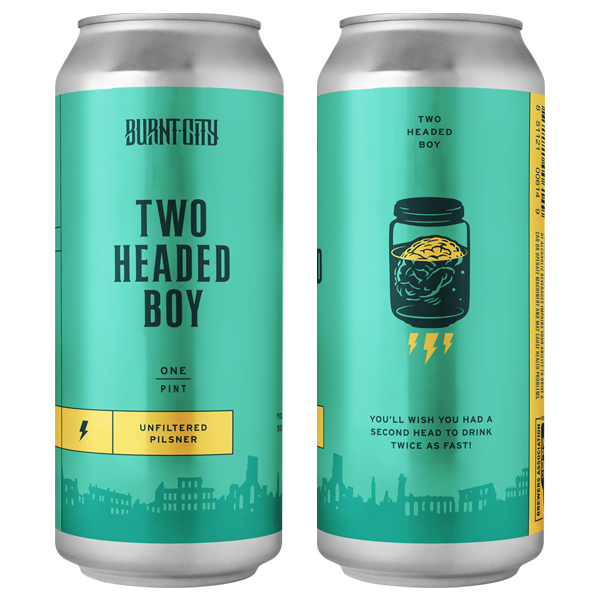 Two-Headed Boy Unfilered Pilsner is available April – July in 12 oz cans and on draft in 1/6 bbls and 1/2 bbls. Two-Headed Boy is a refreshing, unadulterated German-style pilsner. Crisp and clean with a subtle, honeyed malt flavor and a hint of noble hops. Good for shotgunning, sipping from the can, or pouring into a glass. You’ll wish you had a second head in order to drink this beer twice as fast! Two-Headed Boy starts to shake the rust off his gears at the beginning of March when the sun shines but days aren’t quite as warm as you want them to be. He finally emerges in April as Spring firmly takes hold, people dust of their patios and open up their windows. He’s the perfect companion to the dinner parties (or porch hangs) you’ll be enjoying this Spring. Don’t let the two heads fool you, this guy is a relaxed, drinkable sidekick you’ll want to hang with for hours.